Les Enfants Terribles has announced the winner of a new award set up to support fringe companies. The Stepladder award was created in association with theatre organisation House, which aims to improve the range and quality of theatre presented across the South East and eastern England, and Wilton’s Music Hall in London. Theatre company ThisEgg won the inaugural award, which will see the company receive industry mentoring from Les Enfants Terribles as well as support from House in mounting its first UK tour. 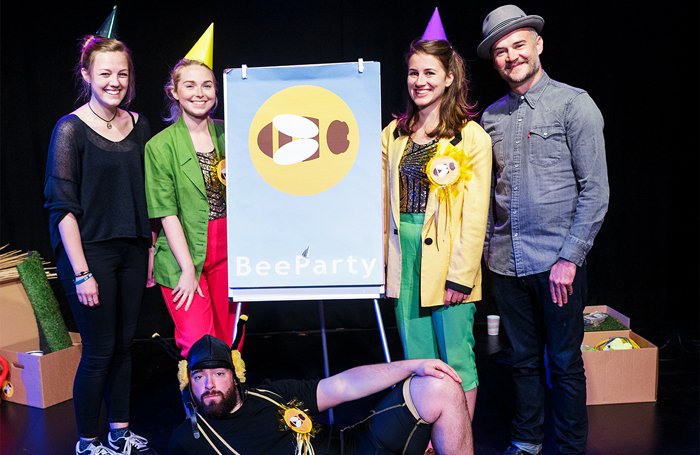 Additionally, the company’s show Me and My Bee, which is a comedy about climate change, will play at Wilton’s Music Hall during the 10-year anniversary run of Les Enfants Terribles’ The Terrible Infants. Details of the performance are to be announced. The Stepladder award was created to support fringe theatre companies making original work as they look to establish themselves within the UK theatre industry. Submissions for the award opened on March 8, and the judging panel, made up of Les Enfants Terribles, Wilton’s Music Hall and House, saw five shortlisted shows during the Edinburgh Festival Fringe 2017 before choosing a winner. Artistic director Oliver Lansley and producer James Seager, of Les Enfants Terribles, said: “We were overwhelmed by the innovation and talent of the five shortlisted companies for the Stepladder award, but we’re thrilled to award ThisEgg as the winner.